All of the pens and pencils shown below are currently in stock. If you have a particular request for a specific wood type or appearance please contact me and I will be happy to accommodate your request. 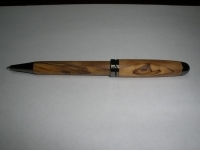 I also have a variety of acrylic and corian that make a durable stain resistant, non-absorbant pen as well as a wide variety of wood types. 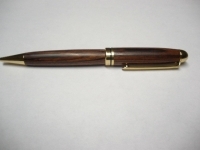 A fine pen is a gift that will be cherished for years. If you are not sure what features you want for wood type or accent color, select the style pen and we will take care of the rest. 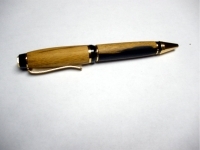 Hand crafted from an authentic 30-06 shell casing wood type and accents may vary. 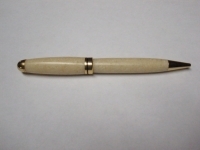 These pens are hand crafted from an authentic White Tail deer antlers and finished with a rifle pocket clip. 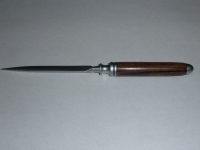 This is the perfect gift for the Sportsman on you gift list. Gauranteed that there will never be two alike. 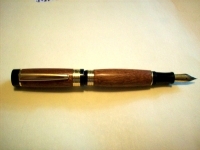 A beautifully crafted larger bodied pen with excellent balance. A chunky masculine powerfully built writing instument. A classic design that is balanced and comfortable.